Sitting in from of the computer wishing you were on the beach? Letting a cute robot skip stones for you on the lake might be the closest you’ll get there today. 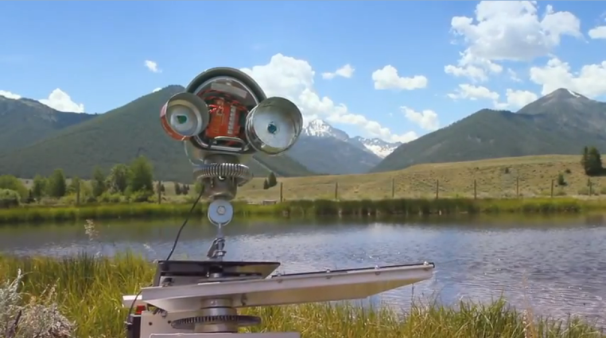 Meet Skippy the robot: This stone-skipping robot comes from Sun Valley in Idaho, and is the most original way to draw visitors I’ve seen all year. Skippy is part of an effort to promote Sun Valley resorts, but it will let anyone from anywhere in the world use its abilities to skip stones on the Sun Valley lake. After signing up, you will get access to a real-time video feed from Skippy, complete with current wind conditions. You can then adjust the angle and force of your stone before Skippy throws it across the water. If you’ve never been able to skip stones before, the experience will turn from sheer fun to truly satisfying. There are two down sides to Skippy: One, there’s quite a line of people who want to use his services, which means you might have to wait a while before you actually get to cast your stone. Two, he’s afraid of the dark, and therefore only works when it’s light out in Idaho (fair enough, since you probably want to see your stone skipping). No matter what time it is or how big the line is, you can always meet Skippy through this video. Did you get a chance to try Skippy?